At this year’s InfoComm, manufacturers are rolling out a new generation of multi-touch display and projection systems that continue to expand the boundaries of the technology in a fast-growing market segment. When coupled with Windows 8, NEC's touch overlays enable content swiping capabilities. “On the large-screen side we’re going to have our V801 80-inch screen, then we’re going to have an 80-inch overlay. That overlay is 10-point IR touch—dependent on the operating system,” said Ben Hardy, product manager, NEC Display Solutions. The displays and overlays are HID compliant for a number of operating systems, he added. The overlay, coupled with adoption of Windows 8, will enable new content swiping capabilities. A new desktop touch screen is also being introduced at InfoComm. According to Gary Bailer, director of product planning and marketing for Sharp's Pro AV products, “We are the number one-seller of B2B embedded interactive touch systems for 55 inches and larger in the United States.” Sharp’s plans for new multi-touch product introductions at InfoComm include its Aquos Board interactive display system. NEC's V801 80-inch screen will have a 10-point IR touch 80-inch overlay option. “We have in today’s lineup a 60-, 70-, and 80-inch product. We’ll be announcing replacements to the 60- and 70-inch; it’ll be the first public showing in North America. The 80-inch stays in the lineup through 2014,” Bailer reported. Four products—the 60-inch PN-L603A and B models and 70-inch PN-L703A and B—replace the previous two. The new displays support 10 touch points and up to four simultaneous users, and include enhancements such as improved cosmetics; tougher, anti-glare, scratch-resistant coating; improved touch sensitivity; faster interactive touch tracking; and redesigned stylus pens. Aimed at collaborative spaces such as small meeting rooms or hotel rental spaces, the new A models, shipping summer 2014, are turnkey systems with embedded control, to avoid user interference. “Built into that embedded controller is the Sharp Pen Software—interactive whiteboarding software—as well as Sharp’s Touch Display Link software,” said Bailer. The latter software enables the sharing of annotations and drawings between the display and connected devices. Sharp’s optional wePresent wireless gateway additionally allows users to share content from devices running on any operating system to the multi-touch displays for annotation, collaboration, and further dissemination. 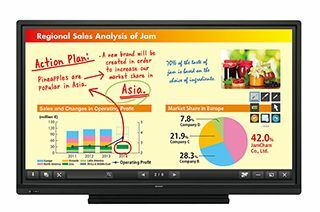 Sharp's plans for new multi-touch product introductions at InfoComm include its Aquos Board interactive display system. “Ten points seems to be the sweet spot for us right now,” said Hardy.